Sorting through every new game on Steam so you don't have to. On an average day, about a dozen new games are released on Steam. And while we think that's a good thing, it can be understandably hard to keep up with. Potentially exciting gems are sure to be lost in the deluge of new things to play unless you sort through every single game that is released on Steam. So that’s exactly what we’ve done. Blendo Games is responsible for Gravity Bone, Atom Zombie Smasher, 30 Flights of Loving and a variety of other indie games. Among the ones you might not have heard of is Flotilla, a 2010 game of spaceship battles in 3D. Now there's Flotilla 2, which takes that same concept and puts it in VR. (I love the bit in the trailer showing how goofy you'll look in those goggles). 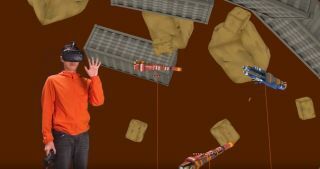 A game that embraces the fact there's no "up" in space seems like it'll be a heck of an experience in VR. Language-learning games and apps won't actually teach you a language, but things like Influent and Duolingo can be fun ways of adding to your vocabulary. Lingotopia's the same kind of deal—you're lost in a city where you don't speak the language, but you can click on objects to find out what they're called. When locals speak, you're invited to guess the meaning of one word until you get it right, from which point it'll be highlighted with a translation in the text. You can choose from a variety of languages, whether Japanese, Russian, Spanish, French, or several others. The camera's a bit swingy and if you're not into tank controls they might bug you, but I learned a few new words of German from Lingotopia and that's the whole point. Plenty of games are about being a dad these days, and yet too few of them let you use your child as an actual weapon. Dad Quest is a 2D action-platformer where you carry a baby around to bash enemies with. Those enemies include pigeons, pigs, and weird helicopter snow beasts. And yes, you can play as a lady dad. Ground Branch is a first-person shooter that's aiming for realism. It's not just the kind of game where you look down and see your body, it's the kind of game where you have to do that to make sure your feet aren't poking out from behind cover where another player can shoot them. It's in Early Access now, and boasts "Accurate ballistics with penetration, bullet drop and stopping power simulation." The focus is on multiplayer, but they're planning to add squad AI so you can play alone. Each of the six episodes of Destination Primus Vita, a first-person puzzle/adventure game, will be told from the point of view of a different crew member on board a spaceship traveling to, you guessed it, Primus Vita. Aliens have stolen Earth's water and you have to go get it back. During the journey the crew goes into cryosleep and then is tested by the ship's AI, which is where the puzzles come in. So far only the first episode, in which you play the ship's quantum physicist, is available. These games were released in the week prior to August 12, 2018. Some online stores give us a small cut if you buy something through one of our links. Read our affiliate policy for more info.